How to Easily Master Format MICROSOFT LUMIA 430 (DUAL) with Safety Hard Reset? Tips and solutions for fix MICROSOFT LUMIA 430 (DUAL) problems. The MICROSOFT LUMIA 430 (DUAL) is cheap product from Microsoft (not use Lumia anymore) which is produce with 4 inches LCD screen and have Microsoft Windows Phone 8.1 operating system. The good news for MICROSOFT LUMIA 430 (DUAL) user, Microsoft promise that in later time, this phone will get update to Microsoft Windows Phone 10. For low price smartphone, the specifications are good such as 8 GB internal memory and can be expand with external memory up to 128 GB, for multitasking purpose, this phone have 1 GB RAM. If we want to keep our important moment anytime, then using MICROSOFT LUMIA 430 (DUAL) camera can take standard pictures up to 2 megapixel, do not ask too much for this camera, but at least we still can have quick documentation in worst situations. How to Fix or Problem Solving for Recovery MICROSOFT LUMIA 430 (DUAL) hang or not responding or malfunctions or stuck or freezing or bricked ? We can get default applications at this phone, but we still can add more free and interesting apps from Windows Phone Store store like Facebook, Instagram, Whatsapp, Blackberry Messenger, Line messenger, WeChat and many more. Skype will get by default at MICROSOFT LUMIA 430 (DUAL) because this applications already own by Microsoft. The problems start comes when some of that applications getting crash and make MICROSOFT LUMIA 430 (DUAL) hang or stuck or bricks or frozen or boot logo loop. Because of this problems, we also can get our MICROSOFT LUMIA 430 (DUAL) LCD touch screen become not responding. At this moment, we have to force shutdown or force soft reset or reboot to restart all running applications and also remove temporary files and caches. If this problem still happen, then we have to do hard reset or master format. Doing hard reset will remove any important data, therefore we have to backup all movie or pictures or all important document before doing master format to factory default. How to Force Shutdown or Force Soft Reset or Reboot or Restart MICROSOFT LUMIA 430 (DUAL) ? What should we do when our MICROSOFT LUMIA 430 (DUAL) getting problems such as hang or stuck or freezing or bricks or LCD touch screen not responding ? We have to force shutdown or force soft reset to clean trouble maker temporary files and caches automatically. How to soft reset or reboot MICROSOFT LUMIA 430 (DUAL)? We can remove the back case cover and unplug or release the battery from its positions. Wait minimum about 5 seconds, and put again this battery at right positions, then continue with press POWER button to turn on this phone again. This soft reset or reboot or restart process will not remove any important data. We can do this shutdown process when our phone still not get trouble for clean up the temporary files or cache or to refresh the running applications. 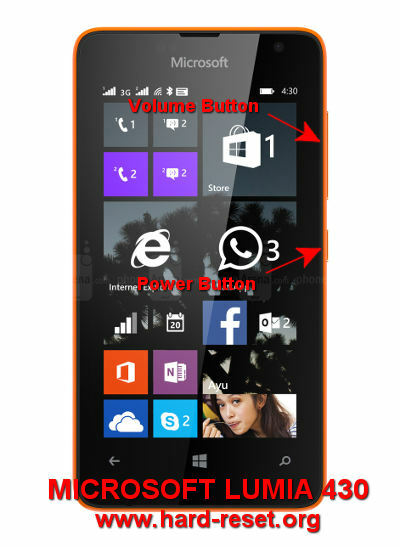 Please Press and hold POWER BUTTON for several second until the phone shutdown by itself, if you see ‘slide down to power of‘, do slide the icon at this phone then MICROSOFT LUMIA 430 (DUAL) will turn off. We need to press Power button again to turn on MICROSOFT LUMIA 430 (DUAL) again. How to Master Reset MICROSOFT LUMIA 430 (DUAL) to Factory Default ? The MICROSOFT LUMIA 430 (DUAL) will do the hard reset format, wait about three until five minutes. While waiting you will see the gear appear until it finish. When we open form the BOX at the first time using MICROSOFT LUMIA 430 (DUAL), this phone already have Microsoft Windows Phone 8.1 operating system and ready to use by finishing Sign-in to Microsoft account. In some situations our phone can get trouble because of applications crash, that make hang or freeze or act not normal which indicate the operating system has already damaged or corrupted. We have to reformat or reinstall or restore factory default operating system to make it work normally again. First, information that we have to know, the clean factory default Microsoft Windows Phone 8.1 file source already saved safely inside MICROSOFT LUMIA 430 (DUAL) ROM. We do not need to copy or connect our phone to other device if we want to do reinstall or reformat operating system. Just follow simple steps to hard reset above, then clean factory default Microsoft Windows Phone 8.1 will be reinstall automatically to our MICROSOFT LUMIA 430 (DUAL). How to Unlock or Fix or Bypass or Solutions for MICROSOFT LUMIA 430 (DUAL) forgot password code or security lock screen or pin (lost password)? We always recommended to give security protections to keep our data secure when our MICROSOFT LUMIA 430 (DUAL) away from us or stolen or lost. We can choose security protections options from software menu. But when we forget security protection of MICROSOFT LUMIA 430 (DUAL), then we can not bypass easily. We should reformat or hard reset MICROSOFT LUMIA 430 (DUAL) to bypass or unlock forgotten security protection or password pin, and unfortunately all data will be remove or wipe as well. How to Improve Performance MICROSOFT LUMIA 430 (DUAL) to make run more faster? What we like from this low price MICROSOFT LUMIA 430 (DUAL) is about processor performance and RAM are good for running daily activity applications, because this phone have Dual Core processor and 1 GB RAM. Why some users get slowly response from MICROSOFT LUMIA 430 (DUAL)? Mostly this problems come from applications trouble or too many applications run in the background. Therefore we have to uninstall or remove some not use applications to give more free space for processor resources and phone RAM. If we want to make MICROSOFT LUMIA 430 (DUAL) performance run faster again like new, then we have to consider doing hard reset to factory default. What is the Secret Code Key for Hard Reset MICROSOFT LUMIA 430 (DUAL) ? There is no secret code for doing hard reset or master format MICROSOFT LUMIA 430 (DUAL). Just follow the step above to hard reset is the easy way to do. The information from this page describe about faacatory recet lumia430,troubleshoot lumia 430,setting for skymap inLumia 430,reset lumia 430,nokia rm 1099 hard reset ket,microsoft phone lumia 430 hard set,microsoft lumia 430 how to remove windows 10,lumia 430 volume complaint,how to reset lumia 430 dual,how to reset 430 lumia factory settings. If you need another resource for hard reset, use search function at this homepage or find from our related posts. How to Easily Master Format LENOVO A5500 (A8-50) with Safety Hard Reset?